Ever experienced having to go to bazaars and events with no idea how to transport goods and booth materials to the venue? This holiday season, worry no more with Transportify’s budget truck rental services and on-demand delivery. Events like Christmas bazaars, expos, and conventions require a safe and convenient way of transporting products, catering, booth materials, sound system, and sometimes even large tents. With our whole-day booking option, Transportify will cater to your event logistics needs for 10 hours. You can even add extra help for the driver if the items involved need lifting. Selling cupcakes in bazaars? Attending food expos? We can sure handle that! Transportify has been delivering food products as a third-party logistics partner to food businesses. Our L300 vans are capable of keeping food products fresh with air-conditioning and protection from sunlight and rain. Our delivery driver partners are trained how to carefully transport goods as delicate as food products. Christmas season always opens school gates to bazaar vendors and marks the start of company events and even weddings. If you need a vehicle to transport your flower and potted plant merchandise to a bazaar venue, or a means to deliver flower decorations to a wedding reception, we got your back. Flower delivery is one of Transportify’s many expertise. Along with our same-day delivery service, event organizers can trust that Transportify can deliver flowers and other items if the sudden need arises. Unfortunate circumstances happen unexpectedly at the last minute like unavailability of any company vehicle or any company driver at the day of event. For times like these, you can count on the local same-day delivery service offered by Transportify. We can accommodate pickup and drop-off needs as long as the pickup is scheduled no less than 60 minutes after the transaction and there is a Transportify vehicle within your area. We wish you the best of luck in attending or creating such events, and if you need any logistics support, Transportify app and services are always available to you this holiday season. Getting ready for Christmas bazaars and holiday company events? 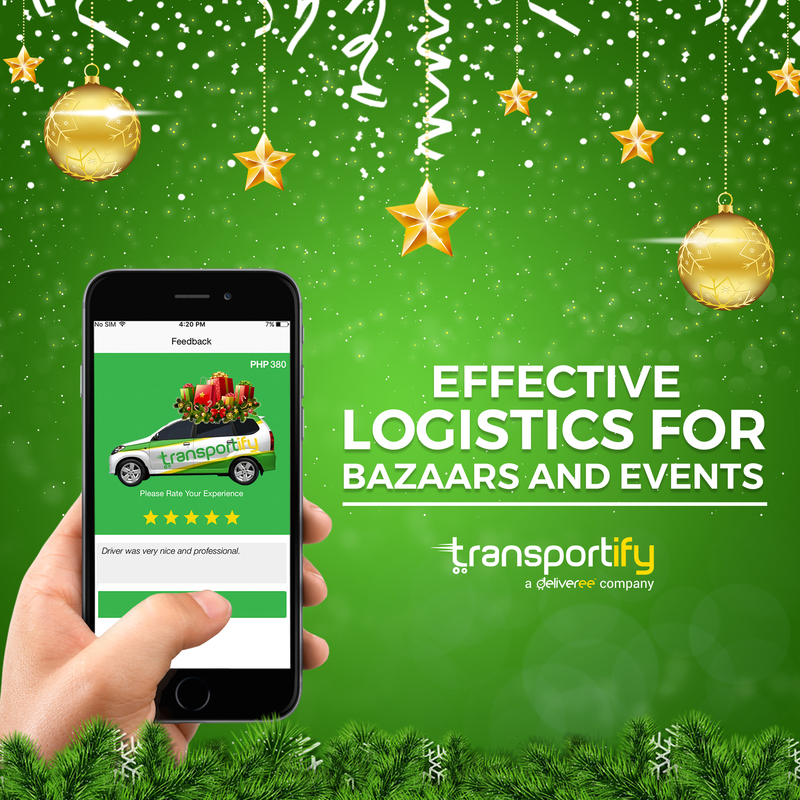 In this article, you will see the different advantages of using the Transportify app and services for transporting goods in bazaars and carrying objects to event venues.